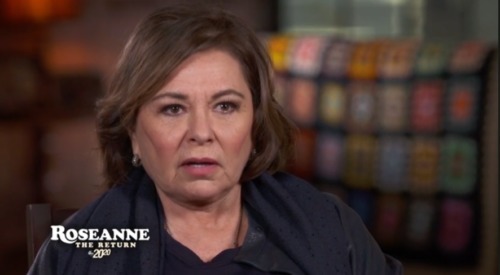 Barr made the comment while speaking with ABC’s 20/20, promoting the Roseanne reboot. The special, Roseanne: The Return, aired last night and can be viewed in full online for cable subscribers. This matches what Barr argued during a Television Critics Association panel last month, where she came in for hard questioning on her support for the president, that Trump was elected by “working-class people.” This despite the fact that the real unifying factor of his supporters is race. White people across all economic demographics supported him more or less equally. A reporter asked why her character on the show, who spoke out against bigotry, would be a Trump supporter, calling him a xenophobe. “That’s your opinion,” she shot back. She then launched into a debunked conspiracy theory about the Clintons and Haiti, before arguing that she would be a better president than Oprah Winfrey, Susan Sarandon, and possibly even Trump. To be sure, America needs to laugh, now more than ever. But if Barr keeps talking up Trump she might find her ratings in the toilet before the show has even aired. As it is, the far-right is already up in arms over the inclusion of a gender nonconforming child in the series. Much like her estimation of the 2016 presidential election, Barr is managing to offend both sides. Whether it will make for TV gold or one of the quickest comeback flops in history will be told in time. Roseanne will premiere on March 27 on ABC.